You can view and manage your clients by clicking on the Clients tab. 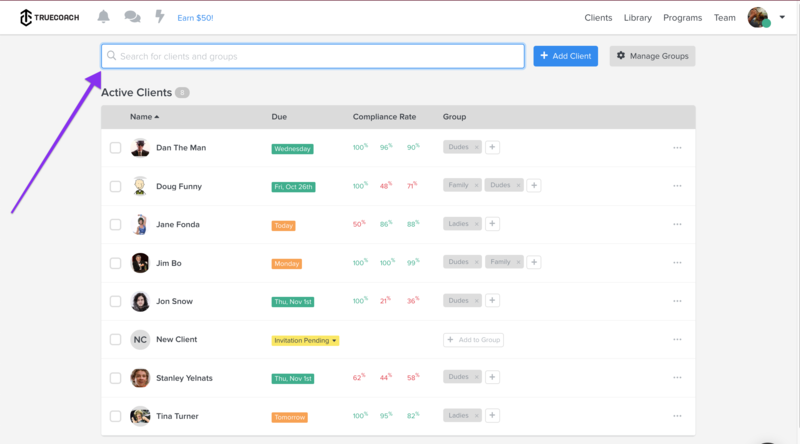 Name: Alphabetically sorting simply lists your clients in from A-Z. To learn more about the client or access their program, simply click the client's name. Chat: quickly send a private message to your client. View Details: access your client's profile for more insight into metrics, nutrition, and other information. Edit: make changes to your client's personal information. Transfer Client: move your client to another coach on your Team Account. If you are no longer working with a client, or you're simply taking a break, you can change the status of the client from Active to Archived. Archive clients do not count toward your plan limit and TrueCoach will retain the data if you want to re-activate them later. Read more on archived clients here.